This plot shows the total probability of neutrinos (top) or antineutrinos (bottom) interacting on a plastic scintillator target as a function of energy. Black points are new results from MINERvA and the colored points are the results from earlier experiments. The solid line is the expected value from simulation. 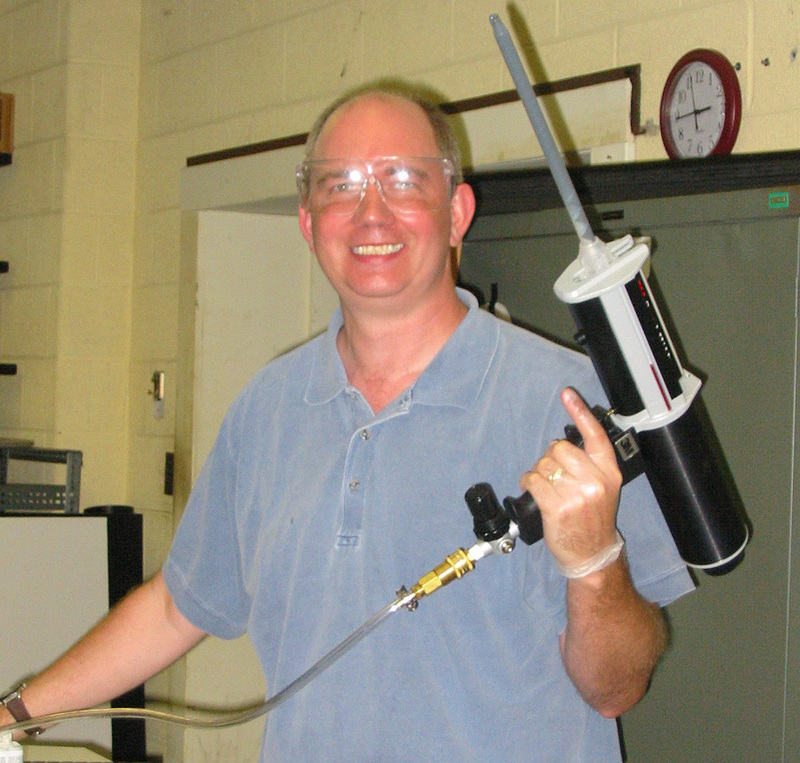 Jeff Nelson of the College of William and Mary is seen here in the process of making a plane of scintillator for the MINERvA detector. He will present these results in the Jan. 8 Wine and Cheese Seminar. Neutrinos are the most abundant yet most elusive massive particles in the universe. They rarely interact with matter and oscillate into different identities over time. In order to understand these ghostly particles in greater detail, understanding and modeling their feeble interaction with various detector materials used in giant detectors is critical. Neutrino oscillation experiments seek to improve and constrain models used in their simulations to match the reality as closely as possible. The MINERvA experiment continues to provide measurements relevant to these experiments to help scientists better model these interactions and implement in their simulation. This week’s Wine and Cheese Seminar at Fermilab features a talk from MINERvA collaboration, presenting its measurement of the total probability that a muon type neutrino (or antineutrino) interacts with the protons and neutrons inside the MINERvA detector via something called charged-current interaction. 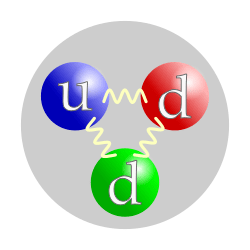 The signature of the charged-current interaction is the neutrino changing into a charged muon (a heavier cousin of electron) by the exchange of a charged W boson. In the process, the neutrino transfers some of its energy and momentum to the recoil proton or neutron. Depending on the energy and momentum transfer, the recoiled particle can experience one of the following processes: It remains intact; becomes what is called an excited state and decays into other particles; or breaks up into individual constituents and coalesces immediately to form other particles. A measurement of the probability of the interaction happening by any of these channels is what is known as the inclusive cross section. When only a small amount of energy is transferred from the neutrino to the proton or neutron, the probability for this charged-current interaction is largely independent of the initial neutrino energy. This provides an alternative method to estimate the number of neutrinos per unit area through the detector, referred to by physicists as neutrino flux, as a function of neutrino energy. This method also provides a valuable tool to complement other methods for determining neutrino flux. The new MINERvA measurement employed this method to extract the neutrino flux and used the extracted flux to measure the inclusive scattering cross sections as the function of initial neutrino energy. This is an event from the MINERvA data that shows the signal when an electron neutrino hits a neutron in MINERvA’s plastic scintillator, becomes an electron and changes the neutron into a proton. The color in each triangle represents how much energy is deposited in each of MINERvA’s triangular scintillator bars. In today’s Wine and Cheese seminar, MINERvA will present a measurement of the probability that an electron neutrino interacts with a nucleus inside the MINERvA detector and produces an electron and no other particles besides protons and neutrons. This new result is the first high-statistics measurement of this process at energies comparable to a few times the proton mass. 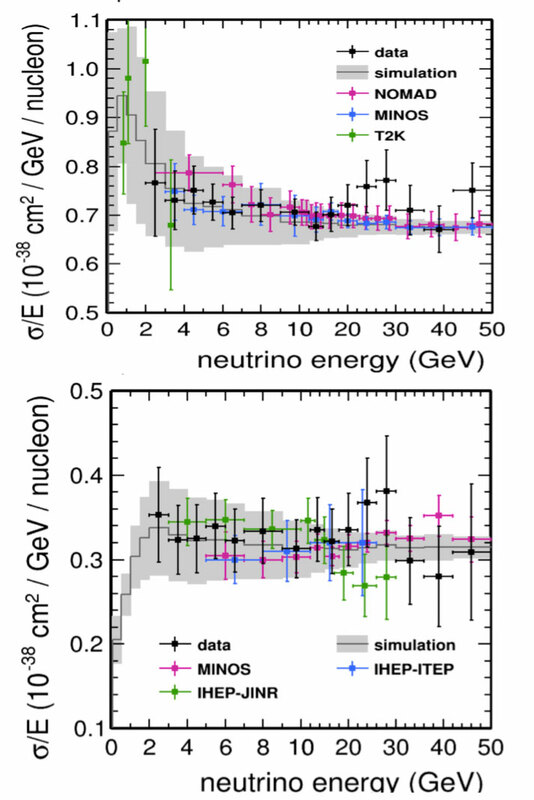 Because of the relative lack of electron neutrino data, simulation programs assume that the only difference in the interaction probability between muon and electron neutrinos is due to the mass of the muon or electron that is produced. Today’s result is the most in-depth look at electron neutrino interaction probabilities ever, and an important check on that assumption. When we compare our electron neutrino result to the analogous measurement for muon neutrinos that was published in 2013, we find that they are consistent with one another. This measurement is a very important input for experiments such as NOvA, which measures the probability for muon neutrinos to change into electron neutrinos as they travel from Fermilab to Ash River, Minnesota. To do that, they need to know how many muon neutrinos are produced at Fermilab and how many electron neutrinos reach their detector in Ash River. The number of neutrinos that reach the NOvA detector is equal to the number of interactions they see divided by the probability that the neutrino will interact. The probability for a neutrino interaction is really tiny and difficult to measure accurately. To get around that, oscillation experiments like NOvA use two detectors, one near where the beam is produced and another far away to give the neutrinos a chance to change flavor. If you take the ratio of interactions at the near and far detectors, the interaction probability cancels out as long as it is the same in both detectors. Neutrino interactions must be the same in Illinois and in Minnesota, right? The problem is that the neutrinos detected at Fermilab are muon-type, while the far detector sees mostly electron-type neutrino interactions. This means it is important to understand any differences in the interactions between the two types of neutrino. In the course of searching for electron neutrino interactions, we found an unexpected background of events that look more like photons than electrons but were otherwise consistent with our signal. MINERvA can separate photons and electrons well, so this background has a tiny effect on our electron neutrino measurement. This kind of event is important for oscillation experiments because muon neutrinos that produce photons can be mistaken for electron neutrinos. We have characterized these background events, and believe they are similar to what we would expect from a process called diffractive scattering, where a single neutral pion is produced by a soft collision with the hydrogen in our scintillator target. Our observation and characterization is a first step towards development of a model to predict this process in other experiments. These results were presented by the author at a recent Joint Experimental-Theoretical Physics Seminar. Mousseau’s presentation is available online. Using a beam of neutrinos, MINERvA has performed the first neutrino DIS analysis in the energy range of 5 to 50 GeV. Neutrinos and electrons interact with quarks within the nucleus differently; we do not expect nuclear effects in neutrino DIS will be the same as electron DIS. All particle physics experiments rely on computer simulations of their detectors to make measurements, but neutrino experiments struggle to test these simulations using particles that are created from the neutrino beam itself. Neutrino interactions often produce charged particles such as muons or electrons, and they knock one or more protons or neutrons out of the nucleus. Neutrino interactions also produce quark-antiquark pairs called pions (see earlier MINERvA results from February, August and January). Each of these different particles gives us a view inside the nucleus, but to make these precise measurements, MINERvA needs to understand what these particles do once they exit the nucleus and enter the rest of the detector. We could simply trust a computer package (called Geant4) that simulates particle interactions, but to be rigorous, we verify that package. 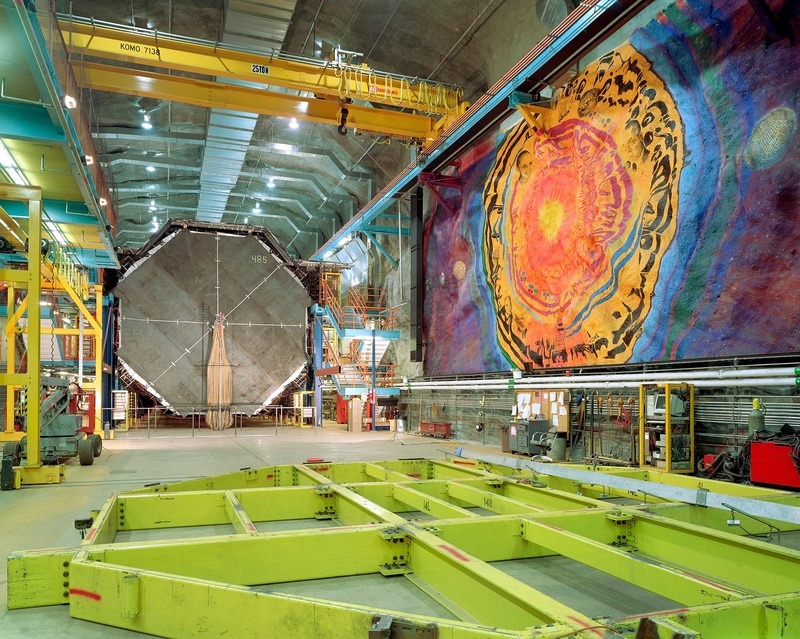 To do this we use a well-calibrated low-energy beam of pions, protons, muons and electrons from the Fermilab Test Beam Facility and a scaled-down version of the full MINERvA detector that is made of planes of scintillator, lead and steel. 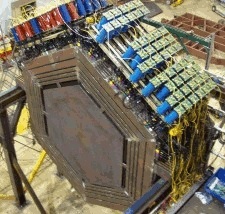 This smaller detector, which can be configured to replicate the downstream third of the neutrino detector, uses the same materials, electronics and calibration strategy. We took data for six weeks in the summer of 2010 using the scaled-down detector and have been poring over this data ever since to measure many different aspects of the way the detector performs. With these data we were able to address, for one, how the kinetic energy of a pion entering our detector is translated into an energy measurement. When we use a popular Geant4 model for low-energy pions interacting in the simulated detector, the prediction is a good, though not perfect, description of the data. 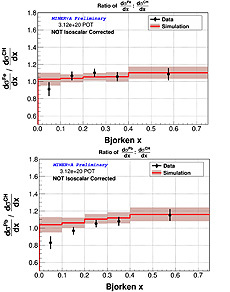 The experiment was designed to test the simulation, and the systematic uncertainties are small enough that we can assign a small uncertainty on how well Geant4 predicts the pion’s energy. We also used the test beam data to measure details about the scintillator material itself to improve the model of the detector geometry and electronics. We also improved how we calibrate both the test beam and the neutrino detector. We have continually fed back all of these improvements into the neutrino analysis since the test beam program started. This has been a benefit to other programs too. 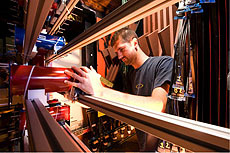 For example, the low-energy beamline design and hardware is now being used in MCenter for the LArIAT experiment. The results have been recommended for publication in Nuclear Instruments and Methods A. MINERvA has also started a second round of higher-energy test beam measurements to match the new higher-energy neutrino beam to understand still more about the way this detector performs. In what they call a “weird little corner” of the already weird world of neutrinos, physicists have found evidence that these tiny particles might be involved in a surprising reaction. Neutrinos are famous for almost never interacting. As an example, ten trillion neutrinos pass through your hand every second, and fewer than one actually interacts with any of the atoms that make up your hand. However, when neutrinos do interact with another particle, it happens at very close distances and involves a high-momentum transfer. And yet a new paper, published in Physical Review Letters this week, shows that neutrinos sometimes can also interact with a nucleus but leave it basically untouched – inflicting no more than a “glancing blow” – resulting in a particle being created out of a vacuum. Professor Kevin McFarland is a scientific co-spokesperson with the international MINERvA collaboration, which carries out neutrino scattering experiments at Fermilab. McFarland, who also heads up the Rochester team that was primarily responsible for the analysis of the results, compares neutrino interactions to the firing of a bullet at a bubble, only to find the bubble was left intact. from Fermilab Today: This MINERvA event display shows a coherent pion production candidate interaction. The neutrino enters the detector from the left and interacts with a nucleus, producing a muon and a pion. The colors indicate the amount of energy deposited at that point. “The production of pions from this reaction had not been observed consistently in other experiments,” McFarland said. By using a new technique, they were able to measure how much momentum and energy were transferred to the carbon nucleus – showing that it remained undisturbed – and the distribution of the pions that were created. “After analyzing the results, we now have overwhelming evidence for the process,” McFarland says. The two members of the collaboration who were primarily responsible for analyzing the results were Aaron Higuera, at the time a postdoc at Rochester and now at the University of Houston, and Aaron Mislivec, one of McFarland’s doctoral students. Working with Higuera, Mislivec wrote the computer code that allowed them to sift through the results and get a picture of the reaction. “Our detector gave us access to the full information of exactly what was happening in this reaction,” Mislivec explains. “Our data was consistent with the unique fingerprint of this reaction and determined how these interactions happen and how often.” The key to identifying the reaction was finding undisturbed carbon nuclei and then studying the two resulting particles – the pion, which is responsible for shielding the nucleus, and the muon. Researchers in the MINERvA collaboration measure low energy neutrino interactions both to support neutrino oscillation experiments and study the strong dynamics of the nucleon and nucleus that affect the interactions. The work is funded by the Department of Energy, the National Science Foundation, and partnering scientific agencies in Brazil, Chile, Mexico, Switzerland, Peru and Russia. The University of Rochester is one of the country’s top-tier research universities. Our 158 buildings house more than 200 academic majors, more than 2,000 faculty and instructional staff, and some 10,500 students—approximately half of whom are women. 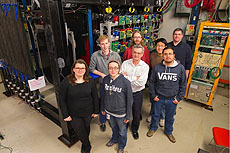 Neutrino researchers work collaboratively, sharing and comparing results to help advance the field of neutrino physics. For Philip Rodrigues, a postdoc at the University of Rochester, receiving a new dataset from the MINERvA neutrino experiment means two things: that one of the neutrino experiments in which he participates has met a milestone and that the other can verify some of its predictions. Rodrigues, who is a member of both MINERvA in the US and the T2K experiment in Japan, is not the only neutrino physicist to double dip like this. More than 50 percent of neutrino researchers work on multiple projects simultaneously. 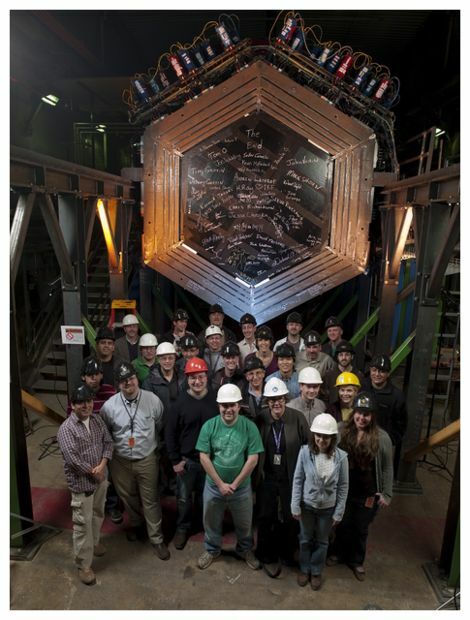 Scientists stand with the Minerva neutrino detector, located 330 feet underground at Fermi National Accelerator Laboratory. Unlike collaborative neutrino researchers like Rodrigues, the neutrino is extremely anti-social. We can’t see it, we can’t feel it, and we don’t entirely understand it. But it may be important for understanding the formation of the universe. The elusive nature of neutrinos makes working together even more appealing. 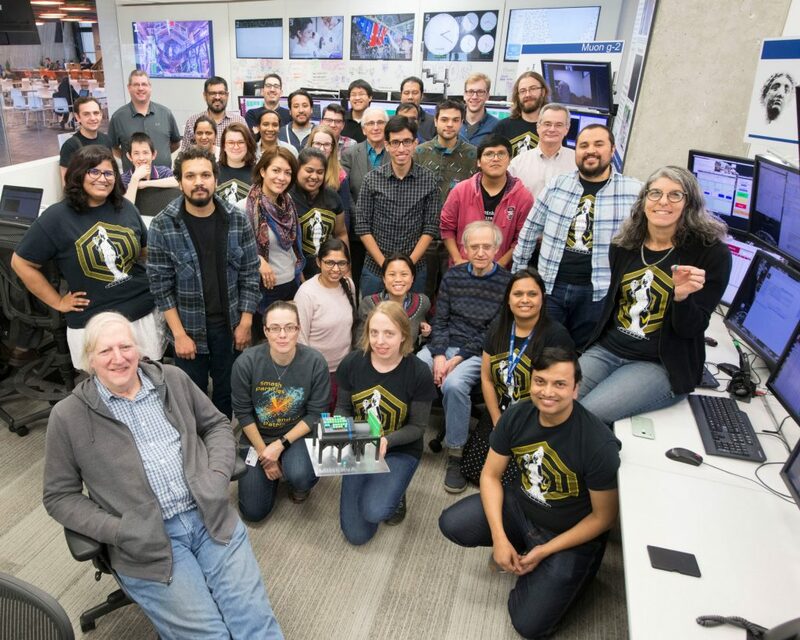 Scientists who share Fermilab’s neutrino beamline meet regularly to discuss neutrino flux, the quantity of neutrinos per unit area observed in the detectors, and how that information can inform their respective projects. Neutrino experiments are usually in one of two categories: interaction experiments and oscillation experiments. The primary goal of interaction experiments is to observe the way neutrinos interact with different materials. The primary goal of oscillation experiments is to observe the way neutrinos, which come in three types, change from one type to the next. Both types of experiments can give researchers insight into neutrino characteristics such as their masses and how the different types of neutrinos relate to each other. Both kinds of experiments shoot extremely intense beams of neutrinos at particle detectors, but the placement of the detector depends on the type of experiment. Detectors for oscillation experiments are located much farther away, miles from the neutrino source, to give the particles time to change. Data from interaction experiments is critical for scientists at oscillation experiments to understand how the particles will interact in their detectors. In addition, data from similar experiments can be used to double-check one another. inside the nucleus. In today’s wine and cheese seminar, MINERvA will release its measurement of what happens when a neutrino or antineutrino produces a pion outside a nucleus by interacting with the nucleus as a whole but leaving the nucleus intact. Neutrino physicists refer to this reaction as coherent pion production. A neutrino interaction with a nucleus is like the break shot at the beginning of a billiards game where the cue ball is shot into a tightly packed group of target balls to break up the group. If coherent pion production were to happen in billiards, the target balls would remain tightly packed after being struck and an additional ball (the pion) would emerge from the collision. Coherent pion production can be a background to neutrino oscillation experiments that measure how neutrinos change from one type of neutrino to another as they travel through space. Predictions for coherent pion production disagree in how much background the reaction should produce in oscillation experiments. 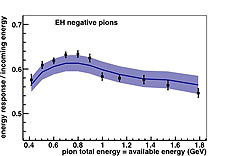 In addition, recent experiments that looked for coherent pion production at neutrino energies important to oscillation experiments came up empty — until now, that is. 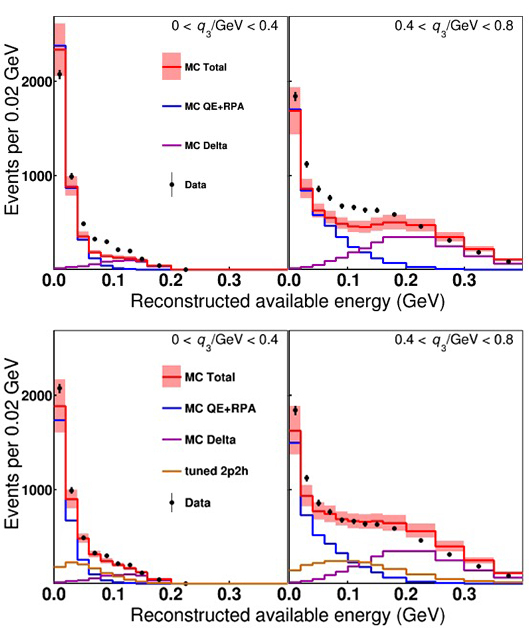 MINERvA has measured coherent pion production on carbon atoms where the interaction changes the neutrino (or antineutrino) into a muon (a heavier cousin of the electron). MINERvA searches for coherent pion production using its defining characteristic — that the interaction does not breakup the nucleus. MINERvA can see whether or not breakup of the nucleus occurs in two ways. First, it can detect the particles ejected from the nucleus when it is broken up and can require that only a muon and a pion are detected at the interaction point. 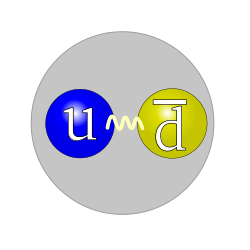 Second, MINERvA can measure the momentum transferred to the nucleus by measuring the muon and pion momentum and can require it be consistent with not breaking the nucleus apart. 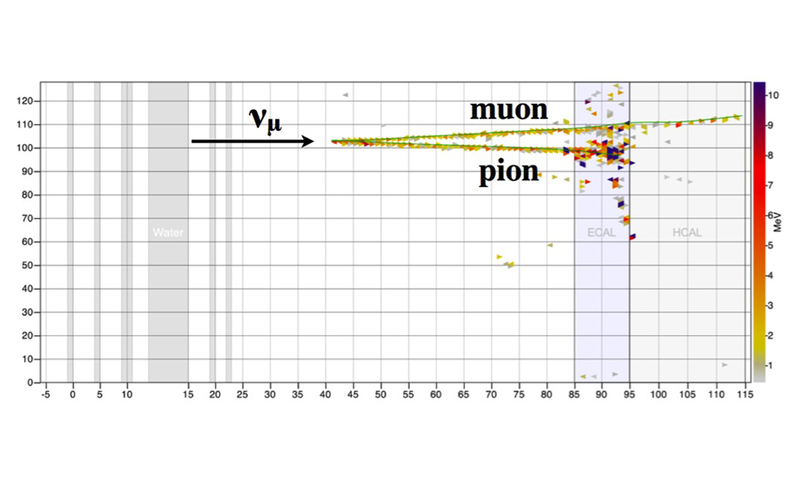 These two signatures together greatly reduce the background and allow MINERvA to measure, for the first time, the details of coherent pion production to understand how it produces background for oscillation experiments.